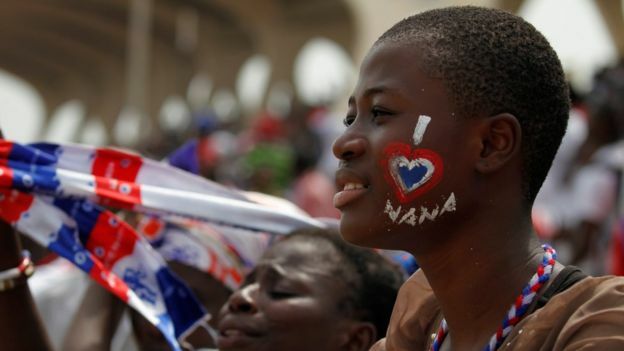 Nana Akufo-Addo has been sworn in as Ghana’s new president after beating John Mahama in last month’s election. 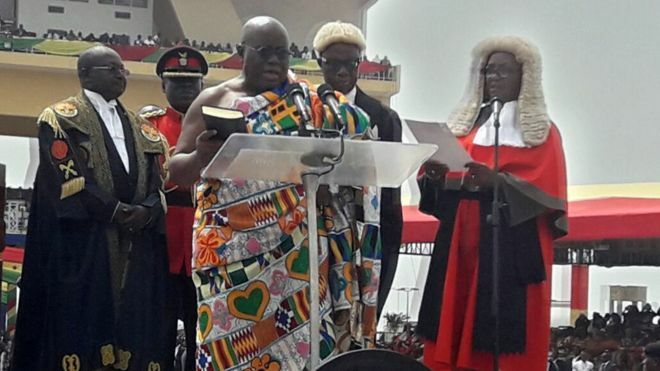 Heads of state from across Africa and thousands of guests and dignitaries watched him take the oath of office at a ceremony in the capital, Accra. Mr Akufo-Addo, a 72-year-old former human rights lawyer, promised free high school education and more factories. But critics have questioned the viability of his ambitions. Mr Akufo-Addo’s inauguration represents the latest peaceful handover of power in Ghana. Taking the oath of office in the capital’s Independence Square on Saturday, he promised to “protect and defend” Ghana’s constitution. He said he would reduce taxes to boost the economy, adding that Ghana was now “opened for business again”. Mr Akufo-Addo later posted the full text of the presidential oath on the social media site Twitter, using the hashtag #Inauguration2017. He tweeted that his position was was not an avenue for making money and that he would not disappoint the people of Ghana.